There is nothing wrong with using canned low sodium and low fat beef broth. I use it all of the time. I am getting on a new kick to try out some Japanese Hot Pot recipes. While the canned broth works just fine, I thought I would make my own stock to give them that extra flare with my own touches. As with any stock or sauce, there are the standard main components: Carrots, Onions and Celery (standard basic mirepoix) with the addition of garlic and herbs and spices. In fact, the only thing that makes the stocks different is the addition of bones or vegetables. With the bones (chicken or beef), it is best to spend the time to roast them first. This can take 45 – 75 minutes. The extra flavor that comes from roasting is huge. It also releases the fat that may be on them.. reducing the need for skimming later. When you take the time to do this yourself, make as big of a batch as possible. You can then portion and freeze for use in any recipe, week nights or . The effort is at the beginning and the end. But it does take hours of time to simmer and reduce to gain the best flavor possible. It is worth it. Fish/seafood stock is very similar as well, but you are sautéing the shells from the seafood, not roasting in the oven. I do not use salt in making the stock. Why? When you are adding stock to a sauce or other dish, you already have salt added for those recipes. If I added salt to the broth, you could end up with a dish that is way to salty. It is easy to add salt then it is to take it away. When I purchase canned stock, I ALWAYS get the low sodium and low fat broths. I add enough of those ingredients to whatever dish I am making, I don’t need the extra. If you turn this stock into a broth or soup, then by all means, when making those add in salt to flavor it for eating right out of the pot. Or add some to a smaller pot, adjust seasoning.. if too salty then, add a little bit of the unsalted stock to reach the desired flavor. Homemade is always better.. but store bought is always quicker.. so find a brand you like and keep some handy. 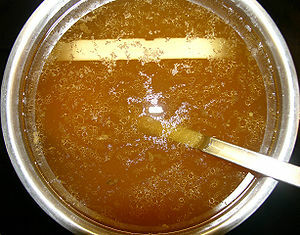 A quick shot of broth/stock always enhances the flavor of any dish. Heat the oil in the stock pot over medium high heat. Once the oil starts to shimmer, add in all the ingredients, except the water. (if making seafood broth, now is the time to add in the shells/bones or additional vegetables for a vegetable broth). Add in the water so the water reaches about 1 inch below the top of the pot. Reduce heat to a medium simmer. Let simmer 3 – 6 hours depending on the amount of flavor you want. Stir on a regular basis (about every 30 minutes). You can loosely cover, allowing the steam to escape so the liquid reduces. You want it to reduce by 1/3 or 1/2. Taste it. If it tastes too watery, then let it keep going. As it simmers, skim off any fat that may accumulate on the surface. When it reaches a nice rich flavor to your liking, strain it through a fine mesh strainer and/or cheese cloth to catch all of the bits and pieces of herbs, etc.. that may be floating around. You want as clear a broth as you can get. Thats it. Let it cool to room temp and if there is fat in the broth, once at room temp, refrigerate over night, and easily lift the solidified fat off the top. Then portion into 1/2 – 1 cup freezer bags and freeze or use in your favorite recipe the same day. Add these in Step 1. And continue with the remaining steps. Place the bones on a baking sheet and roast for about 35 minutes, turn and roast another 45 minutes. Place the bones on a baking sheet and roast for about 35 minutes, turn and roast another 30 minutes. The bones should be nicely browned. Its ok if there is still meat on them. Add these bone, hot or room temp, in step 2 above. Add these bones in step 2 above. Add in step 1 and sauté with the vegetables, stirring regularly until the water is added. Posted by culinaryease on June 20, 2012 in Cooking for two or less, General Cooking, Recipes, Vegan/Vegetarian and tagged beef stock, Broth, chicken stock, seafood stock, Soups and Stews, Stock.